I’ve known Kevin for years and gamed with him occasionally, but this is his first time joining our gaming group. Like many older gamers with jobs, families, etc., he sometimes goes for years without really being able to swing regular campaign participation, but then gets fed up with it and makes the time. Welcome aboard, Kevin! 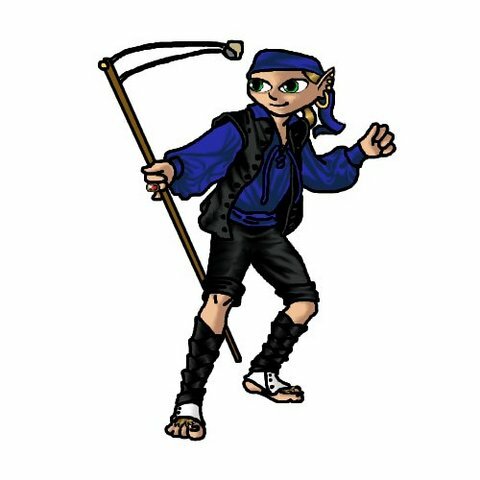 Here’s his character, the halfling rogue Tommy Blacktoes. Tommy is a rogue’s rogue and has few “true” friends, and only one person with whom he has a genuine, yet reluctant trust: Saul Vancaskerkin, the proprietor of the gaming establishment The Golden Goblin. He is quite charming and attractive, but uses this to strategically position himself for his own advantage and personal gain. He is however quite bright and smart enough to know whom to cross and whom to not…usually.